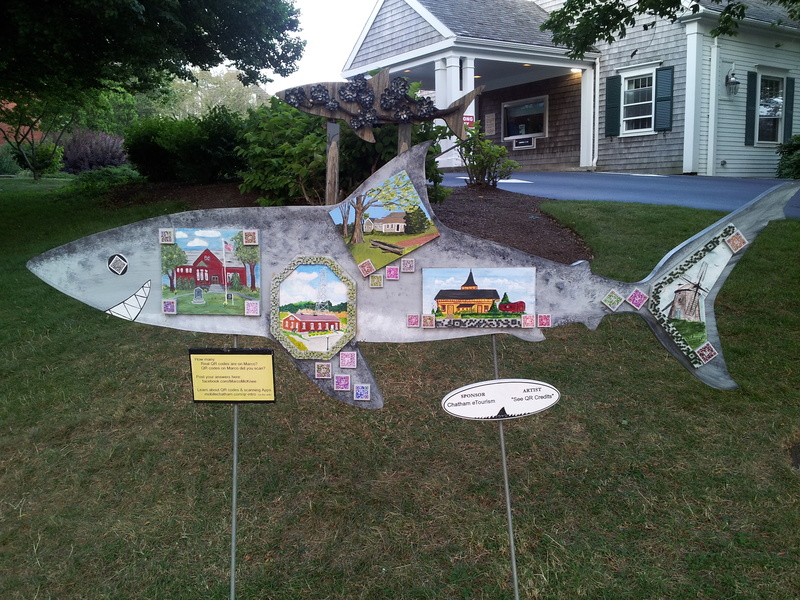 If you love Cape Cod as much as I do, maybe visit often, or even own a summer house, perhaps you would like to bring your Cape Cod house or Cape experience home with you? It seems like overnight different variations of paint nights have popped up all over -- and people are enjoying picking up a paintbrush and creating. 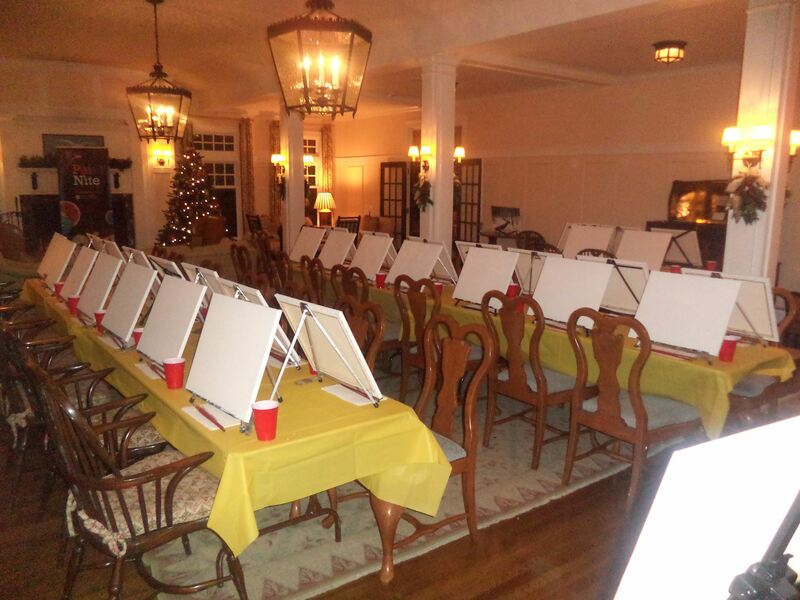 After many friends asking over the years about painting, wondering if I could show them how, and starting to attend paint nights and raving about them I decided to start offering paint nights in my own home for friends -- hence the name Paint Pals. 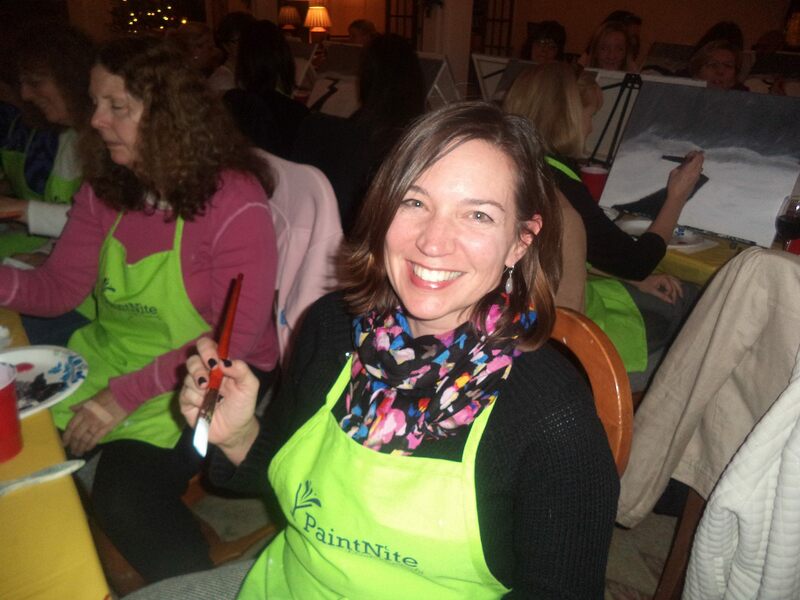 Paint Pals has grown quickly and I am now receiving requests for private girl's night out parties, as well as requests to go other places like church groups, sales meetings for team building, and private parties in homes. It has taken on a life of its own in the last few months. But for any of you who do this, what I find as a challenge is creating the paintings that a non-painter can paint well in 2 hours time. A few nights stretched into a third hour as people struggled to complete the painting - never mind the finishing touches I might have added myself. It has made me step back and really think about the teaching element when I am relying on nearly 35 years of ingrained painting experience, and finding the right level for a group of people with varying skill levels. I am reminded of my art teacher in school and I wonder if they ever got frustrated - teaching a class with different artistic skill levels and keeping the class moving at the right pace to keep the artistic kids challenged and the ones with no skills motivated. All teachers for that matter need to teach to the common denominator -- but in small at home classes, I find I can give individual attention that the big classes at restaurants and bars and storefronts can't give given their class sizes. I've been creating paintings to build a Paint Pals calendar and I force myself to paint differently - modifying my style, number of colors, etc to offer paintings that people can complete and be happy with. I'd love to hear from other artists that get involved with teaching these types of classes -- what works and doesn't work! What subject matters are most wanted? How to keep students moving along? How to gear subject paintings skill level? In the meantime, I will continue to hone my skills as a teacher to hopefully deliver the best customer experience I can to those who sign up for my classes! I read a book once by Peter Mayle, A Year in Provence, and loved one line in the book that went something like: We saw the house in the afternoon, and by dinner we had mentally moved in. 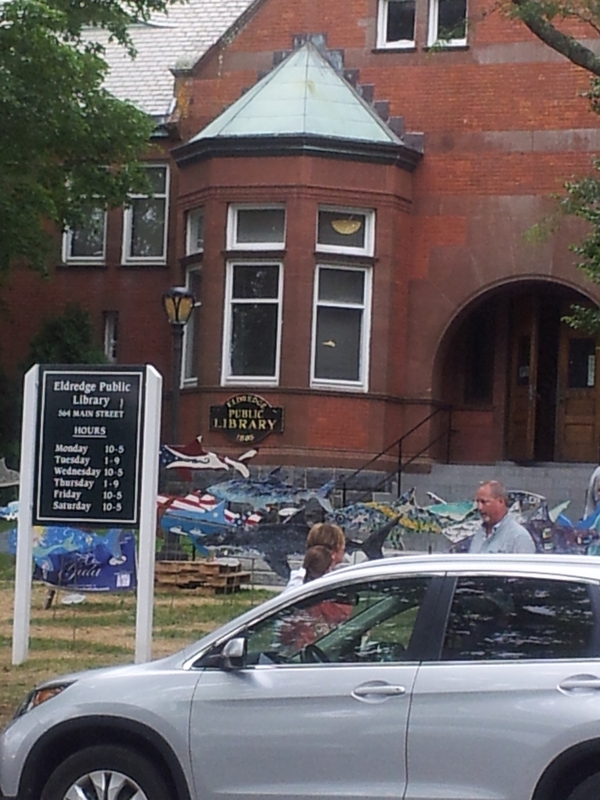 That feeling was something like when I went to Chatham for the first time. After my first afternoon, I knew this was where I wanted to summer, own a cottage, and it became in a blink of an eye my "happy place". I just finished this larger canvas (24x36) of the Chatham Fish Market and was pleased with it. Now I just need a house in Chatham to hang it in! 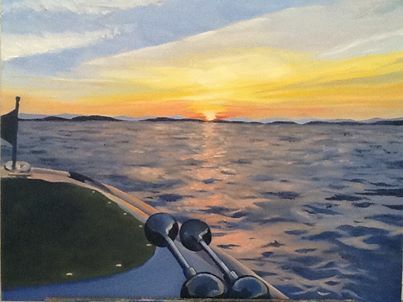 Actually, I may approach some galleries in Chatham this summer and see if I can get some of my work placed -- but that always seems so daunting as a few have turned me away before - or made comments such as, 'well, we like to show "local" artists'. Eventually, I tell myself, since I have already mentally moved there. A dear old friend did something incredibly nice for me. They wouldn't let me help pay, waving their hand to shoo away the idea like a bothersome fly. "I am happy to do this, I don't need the money", my friend said in their very generous way. And so it was done. But was it? I didn't feel so, especially when they followed up with another generous offer of tickets for my two boys and me for a sporting event - and we Bostonians love our sports. Great seats, great time. Now I really wondered how could I pay this friend back when they are so generous to me but won't take money? Give them a gift back! An offer they couldn't refuse. . . a painting. I am sure all of us that dabble, or do mare than dabble, in some form of art have given pieces of your work away as gifts from time to time. The joy is so much greater to see the recipients face light up and know how you have given a one-of-a-kind expression of your friendship or appreciation. We also, more often then we let on as artists, have doubts up to the point of unwrapping if the work is really good enough. No matter what the level you are at, its the gesture - the time spent thinking, planning, creating - that goes into the piece that is what gets appreciated. That person knows you thought of them the whole time and it wasn't a quick run to the mall to buy something, you made it. I am including a picture of the painting here. It was from a special photo they had taken and I hope that my friend has a chance to hang it, enjoy it, and know how much I treasure their friendship when they look at it. So, think about sharing your gift as a gift more often! And if your talent isn't painting, pottery, sketching, jewelry-making, or photography but something like gardening or baking -- do that! Make up beautiful pots of mixed flowers that can be enjoyed or their favorite cake or pie. Better yet - don't wait to use it for a thank you or birthday gift - just do it to be thoughtful. It's an old-fashioned gesture that is missed! I take breaks from painting - not by choice, but due to life. I work, have a family, am a single parent, and I have other commitments and things I am involved with. There are weekends that start off where I look at my canvas, excited to get started and I think, I will just get the laundry started and then get started, or I should go shopping first and start this afternoon, or the phone rings and company is on the way . . . and before I know it its Sunday night. Life. 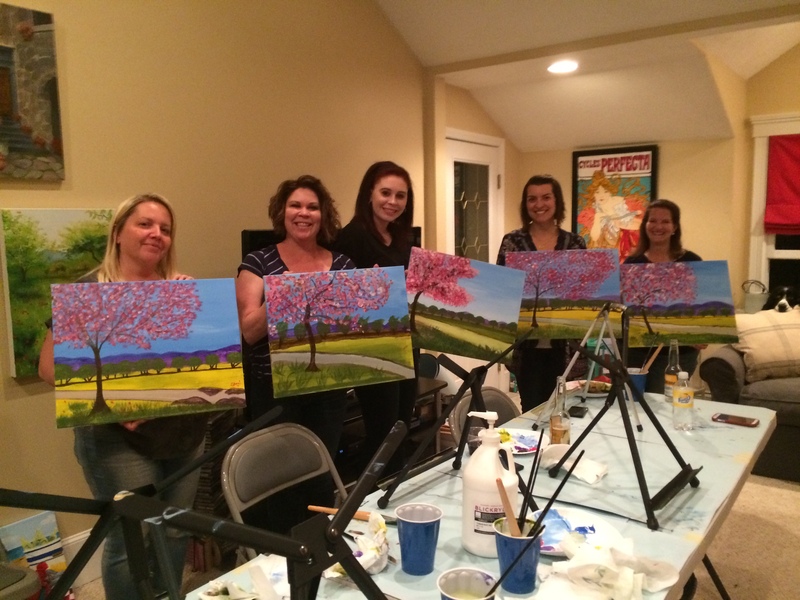 [caption id="" align="alignleft" width="360"] Me at Paint Nite[/caption] But with life getting in the way of too many weekends lately, I decided to schedule some time with a friend to attend a Paint Nite in my favorite location - Chatham, MA. You may have heard of these events - they set up in a bar or restaurant, bring all the supplies, and an instructor guides a room full of (mostly) women sipping wine through a painting in two hours flat. Not exactly what I had in mind for my next artistic creation -- but I found it was fun! And, more importantly, it reminded me that art is part of my life and I need to make time for it - even if scheduled into a two hour block. By taking a step back, and participating in a class that I thought was strictly for novices or beginners, I was able to move forward and get my head around the realization that my artwork is a part of me that I should not ignore. I am happy when I am creating - whether writing a book (I write, too) or creating a painting or doing something crafty . . . By putting all of life's responsibilities first, not only would I never really find the time to paint, but the frustration of looking at those lovely blank canvases week after week is enough to drive you mad . . . and then who cares if all the socks are matched up in the laundry basket? 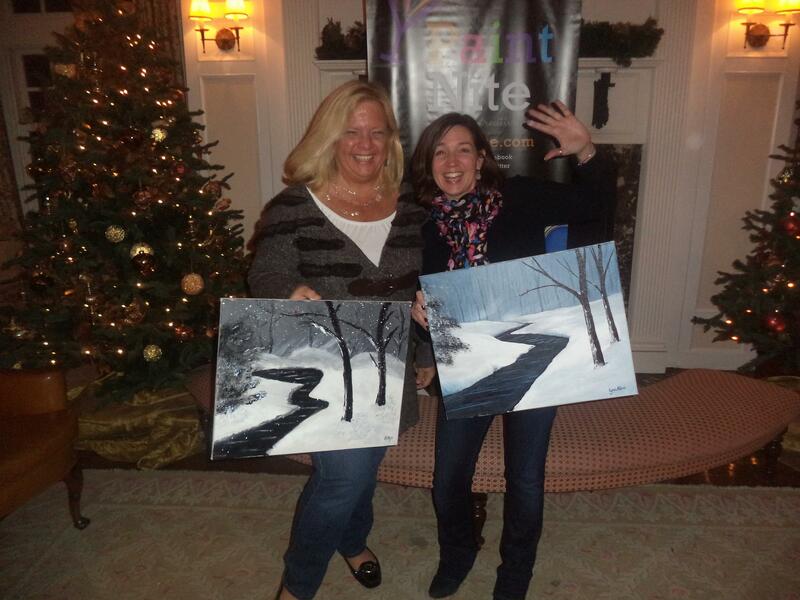 [caption id="" align="alignright" width="428"] Our two hour masterpieces! [/caption] Also, I found that by letting myself approach the class as just a fun night with a girlfriend over wine, relaxing and talking, not expecting to gain much, I learned a new trick. Something simple that I may have learned years ago and forgot, or never knew at all - but it gave me a sense of excitement to get home and paint and try this technique again. Lastly, even if you paint as just a hobby - or never painted at all - I would suggest trying one of these Paint Nites as an entertaining night of exploration. All 32 of the women (and one man) at Chatham Bars Inn the other night let their inner artist out, had fun, and went home with a new creation. And isn't that what life is really about - having fun, being creative, enjoying friends and continually learning and pushing yourself to try new things? 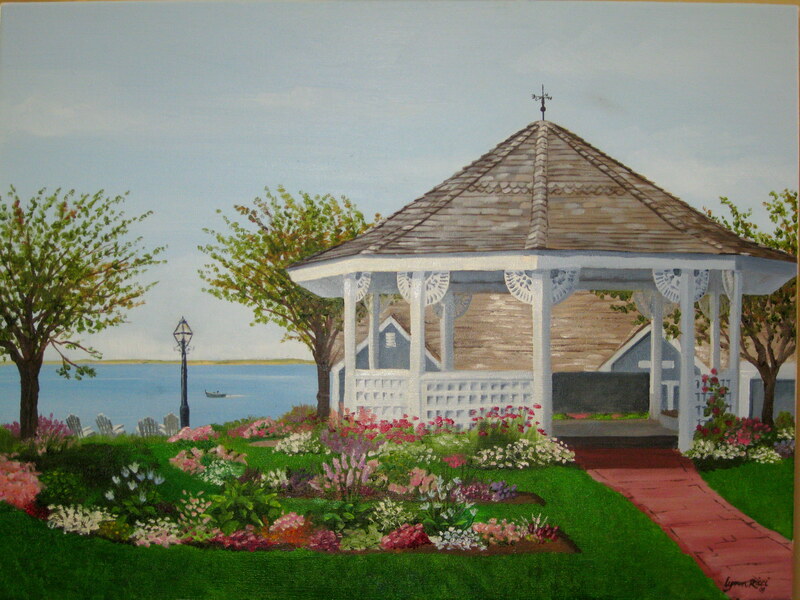 [caption id="attachment_13" align="alignright" width="300"] Chatham Bars Inn Gazebo, Chatham, MA[/caption] Over the years I have had places online where I could direct people to my artwork - mostly family and friends. I never really put the time and energy into building my online portfolio, yet somehow I was able to actually sell some of my work, take commissions, and attend a few local art fairs. This is a bigger leap for me - a more visible way to share my completed work and, as sometimes happens with artists, a way to motivate me to continue to produce. Today I am planning to start a new painting. I pulled together photos from my last visit to Chatham, MA . . . my favorite place. 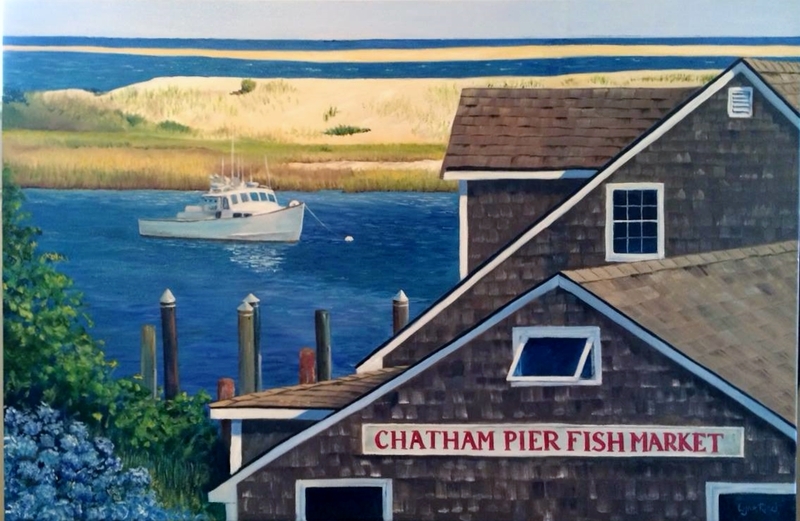 Chatham, and the ocean in general, have always been an inspiration for me . . . a place where I am happy, relaxed and my mind can wander creatively. 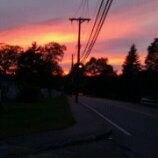 I guess it's no wonder then that I enjoy painting the ocean, our great New England lighthouses, and of course the place where I want to be right now with my canvas . 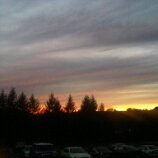 . . Chatham. I will start posting some of my work and will continue to add over the next few weeks until I find my way back to the beach, get my toes in the sand and my head in the clouds.